A bitter cold wave has settled into the region and I have not been to the river in several days. But with yesterday being the last day of the year I felt compelled to mark it with a few observations. I'm glad I did although it took about an hour to warm my feet up afterward. The cold weather had brought many geese and ducks to the open river and to the moving waters below the dam. I don't know how they manage. I'm sure I'm anthropomorphizing but all the animals seem a bit more focused in their dabbling and diving for food. And for many long stretches of time, the geese are immobile with their faces buried in their warm feathers. There were two animals that were noteworthy that I was unable to draw. 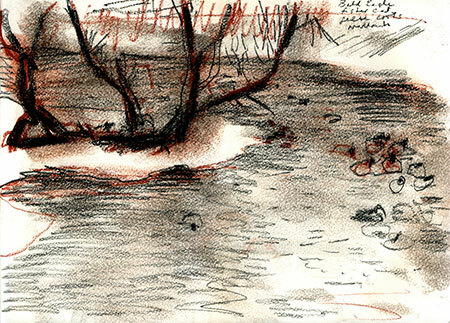 One was a Fisher who waited patiently on the ice shelf below the willow tree out in the river. 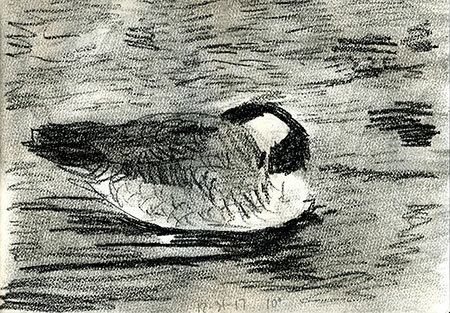 The rafts of mallards and lines of geese knew it was there and stayed far away. It stalked them back and forth in slow motion as far out as the ice allowed but it was just a game to the birds. Perhaps the Fisher got lucky at dusk. The other animal was a majestic Bald Eagle which soared above the bridge and wheeled close to the dam. This happened as an old acquaintance made her way across the bridge to the mailbox. Faith and I hugged and wished each other Happy New Year. I thanked her for bringing the lucky eagle! Last year I saw another eagle a few times. One of those time a group of crows intimidated the eagle away from some carrion it was nibbling on out on the ice. 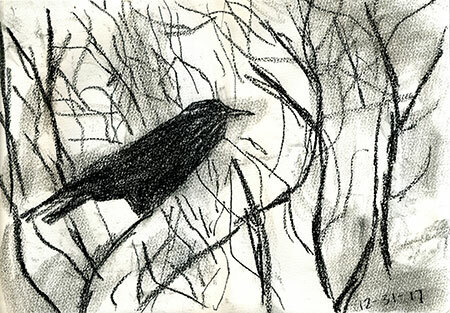 It took refuge in the trees above as the crows squabbled over their treasure. There were crows yesterday too but it was too cold and breezy for them to get too obnoxious. They stayed up in the trees muttering about the few people down below and how stupid they were to be out in the cold weather when they didn't have to be. Well, some of us had to be: those addicted to Beauty and Nature. Happy New Year.